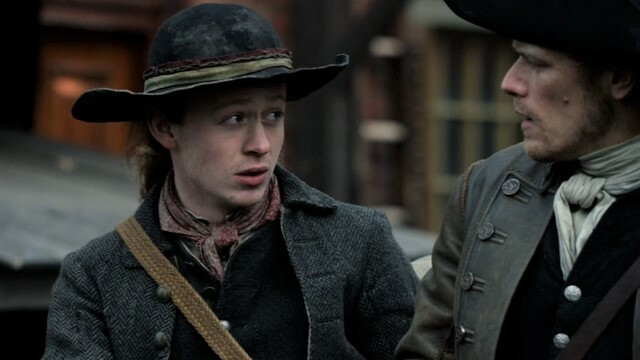 In the previous episode of Starz’s Outlander, Governor Tryon tasked Jamie with finding settlers for Fraser’s Ridge, and the Frasers made peace with the nearby Cherokee. 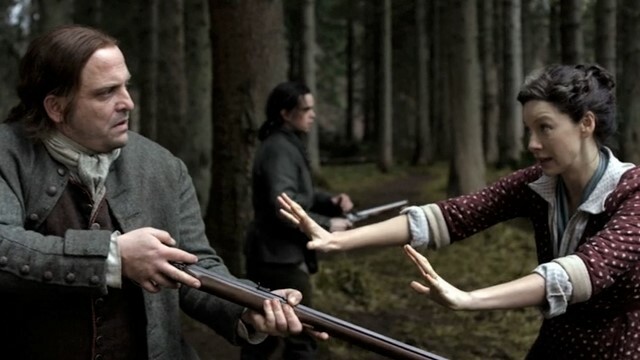 In Outlander season 4 episode 5, Jamie and Ian travelled to Woolam’s Creek to recruit settlers, and Claire delivered a baby for a German family. Jamie and Ian armed themselves with dozens of flyers to recruit Scots to settle in Frasier’s Ridge. He offered 100 acres without rent until a good harvest and then a half-penny afterwards. Unfortunately, all the farmers he spoke with refused the offer. They had previously given up their land after Tryon’s collectors demanded unreasonable taxes. They were about to leave empty-handed when Ian discovered that the horse’s bit was broken. He found a blacksmith, who demanded high compensation as he was about to leave for the day. Unknown to Ian, the blacksmith was Jamie’s godfather, Murtagh, who we last saw leaving for the colonies as an indentured prisoner. When Ian told Jamie how much he had paid, Jamie went to see the smith. Jamie explained to Murtagh how Claire had returned and that his daughter Brianna was living in 1971 Boston. He invited Murtagh to settle on Fraser’s Ridge, but he declined. He invited Jamie to a meeting; he was the leader of the Regulators. Murtagh asked Jamie to join, but since he promised Tryon that he would help stifle any unrest, he couldn’t. Jamie and Ian left Woolam’s Creek without Murtagh, but arrived in Fraser’s Ridge anyway. Claire and Adawehi became good friends and taught each other words in their languages. They were helping Claire prepare for a baby delivery at the Muellers’ cabin. The delivery was a success, and they named the baby Klara after Claire. However, Gerhard noticed some Cherokee, including Tawodi, stopping at the creek to get water for their horses. Claire quashed the standoff between them, and Tawodi relented only because of her friendship with Adawehi. He blessed the water, which alarmed Gerhard. Days later, Pastor Gottfried arrived at the Frasers’ cabin with terrible news. Klara, her mother, and her uncle were all dead from measles. Gerhard believed the Cherokee had cursed them. Gottfried warned Claire that Gerhard had gone insane. Claire went through the week, alone with only Rollo, on high alert. Gerhard arrived but appeared calmer than she expected. However, he brought with him Adawehi’s scalp, since he believed that she was a witch and was responsible for the curse. The Cherokee came to the Muellers’ cabin and attacked with fire arrows, burning it down and killing Gerhard and his wife. Roger went to Inverness to track down Brianna. She had paid a one-way fare to Craig Na Dun. He inquired with Miss Baird, who now ran the inn, and Brianna had left a letter that was supposed to be mailed to Roger in a year if she didn’t return. She had gone after her mother to warn her about the fire. She asked Roger not to follow. At the end of the episode, we see Brianna disappear after touching the rock. What did you think of this episode of Outlander? Let us know in the comment section below! 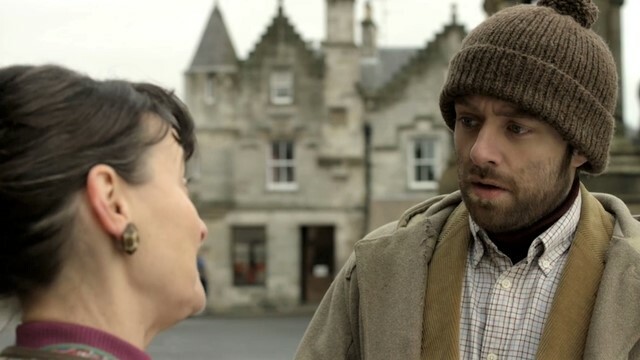 The post Outlander Season 4 Episode 5 Recap appeared first on ComingSoon.net.